Thing is: when you live with something, day in, day out, it’s easy to forget why it’s there. Where I live, the trees have always been there, great tall life forms which live on a different time scale to us humans,. They write their life on the rings in their frame, chronicling hardships and good times, grave, composed. The trees in Windsor Forest are the possessions of kings and queens, a lesson in longevity, and in patience. They are testament to the investment in a tiny sapling with a view to the long game. I hitched the dog to a lead this evening and headed out into one of the world’s oldest managed forests. It was overwhelming today: the waft of leaf mould and pine needles and wet fertile mud, the pure poetry of this place distilled in a heady mix bound straight for the most primitive part of the brain. And tonight, I don’t know why, I just wanted lungs full of that air. I stood, and breathed, and breathed. It cost me nothing but the decision to step into a forest in wet twilight, and yet it was a pearl without price. And there I stood, outside my society, alone on the forest. It seems men have forgotten this seminal moment, what with their televisions and their career paths and their shopping malls. This is life, not that other stuff. We walked on to the entrance to the old iron age fort. And I stood there. The leaves were falling and it was wet and a ragged place, auburn and drab brown, laced with the wise aged green of lichen. Insanely, I had an urge to stretch my arms out and somehow take in this place. Futile. But primitive: I think woman have done this before, in this place, for other trees than these. For forest is a heady mix. It can bring to the surface a memory which has been petrified for millennia, though I am only half a lifetime old. Respect for the trees can be a matter of ridicule, and the tree hugger is an oddity. Half way across the world in the Himalayas, just decades ago, war brought undreamt of changes. The upper regions of the Himalayas had been protected from the modern world because it had no roads. But India’s 1962 war with China made the region wary, and army bases were built along India’s border with China. And with the bases came roads. The moment someone had unlocked the door, the woodsmen came. Timber merchants and commercial foresting companies moved swiftly in to gut the region of its trees. But: the trees were there for a reason. They hold our earthy crust together, you see. They ground us. They stabilise us. And without the roots of the trees, and that pungent layer of leaf mould to absorb water, the upper reaches of the Himalayas began to crumble before the eyes of their inhabitants. In July 1970, impending calamity took centre stage. There was a cloudburst; and a landslide blocked the Alaknanda River. Without the trees to create spongy ground, and pin the place together, there was carnage. 600 lives were lost in a 350 km stretch of the river. Villages, roads, bridges: what are they in the face of the natural might of water? And so the local women began to hug the trees. If they surrounded them in rings, the woodsmen could not touch them.They clung to those life forms which stood between themselves and disaster. The trees are our silent defenders. They will not voice their concerns in parliament, or broadcast them to the nation. But it does not do to forget why they are here. Posted in Shrewsday MansionsTagged Alaknanda River, deforestation, forest, himalayas, treesBookmark the permalink. I sympathise completely, Sidey. the forest leans in on my garden. In truth, it has almost taken over. 😀 I am sure a carpenter like you uses wood with respect, Charlie. I hope you get that forest walk before too long. So you live in an area which doesn’t have them? I lived in Cornwall for a while. Rugged and beautiful, but I yearned for the forest. It has them but not in abundance…. I thought you still lived in Cornwall… where do you live now? When I go somewhere without trees it is the first thing I notice. I love the trees and forests in our country – the first green shoots in the spring, the dappled shadows in the summer, the golden lanterns in the autumn, and their bare silhouettes against the winter skies. We mess with trees at our peril. We do, Rosemary. I think we don’t operate on the same temporal scale as they do: pure short-termism. You write about that moment so well, Heather. I must remember when I am in the midst of hustle and bustle, what I truly consider most important. I truly enjoy your writing. This piece really touches my heart as it defines a part of life that I had not discovered until we moved out here, to the edge of the forest. A forest is feeds the spirit, Roger, I am sure of it. I feel guilty…I got rid of 2 in my garden recently…I couldn’t see the trees in the distance….I do love walking in the forest!! We have had to do the same, Lisa: sometimes proximity to a house makes it necessary. But that’s not the same as the carnage in the HImalayas. I hope you get your next forest walk soon! Did it work? Did they save the trees or did the loggers just come back at a later stage? Powerful thoughts, we have a hard time remembering that our stay on this world is short and our role should be to make it a better place for those who follow. We need to consider the long game, Lou: but many humans find it hard to think further than a lifetime. 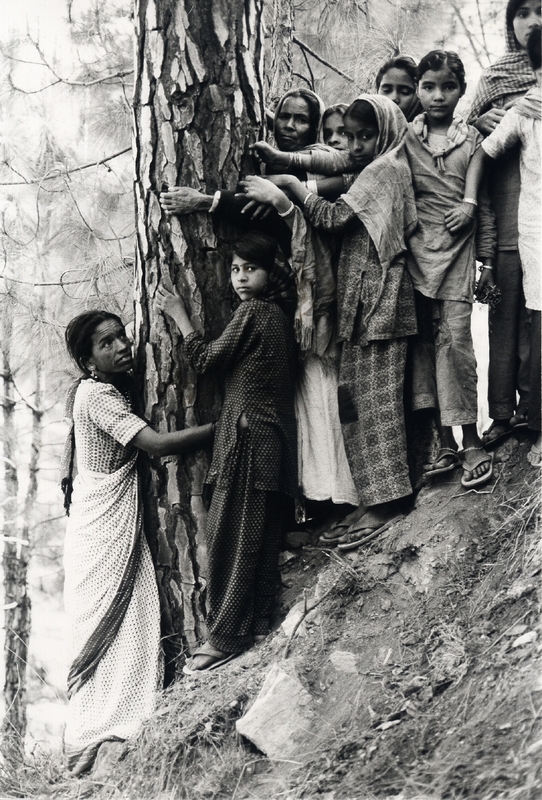 The Chipko movement was amazing because suddenly the fate of the trees impinged on the lifetimes of people. Suddenly, it was personal. Tree Huggers everywhere – stand proud! No trees, no humanity. It’s that simple (and scary). Hi Quixotree 🙂 You put it very well. Time to stand proud. They do, IE. Extraordinary fellow earth-dwellers. Sad, but true. Deforestation is still rampant in India, not only in the forests, the cities too are losing the green canopies in the name of development. It is a crime that with all we know, and with all the battles which have been fought, greed is still getting the upper hand, Deepa. Maybe more of us should be hugging trees. “They write their life on the rings in their frame, chronicling hardships and good times, grave, composed.” Wonderful. A tree hugger myself, as you can just imagine, your words hit to the core of existence, Kate, and this is so eloquently rendered. We have planted three trees here on the cutoff since we moved in, and will plant another in honor of little Ezra, though we will never live long enough to see them reach their majestic heights. We plant them for the next generation, but, you know all that. I loved this post with its neverending theme and its poetic feel. Thank you. We should always keep in mind what happens to the bad guys in fantasy literature when they mess with the trees – waking a forest can be a dangerous thing. silent Majority”in his campaigns as if it was admirable to be part of the class. Normal people.People that were moral, went to church, taught their kids Christian values,worked, raised their families and paid their taxes and did not protest in the street against war and racism and changing times of the 60’s. Well silent does not make for democracy because we should never be satisfied with the status quo. Democracy is an endless process of refinement. It is, Carl, and you put is so eloquently. The tree huggers made their voice heard with the legislators, eventually, in the Himalayas. Thanks, Nancy. It’s hard to describe, that rush. But a singular experience. Nothing soothes my soul more than walking in the woods. I love the smells and the sounds. I should feel threatened by the silence and loneliness, Andra, but I never do. It is always companionable. Thanks Lexy 🙂 And of course there is nothing better than a trusty dog to trot around as you walk! Once it’s gone … it’s gone. Indeed. Frightening when you know the consequences, Judy. What this said to me -more than just a walk in the woods, an more of cleansing. The smell of woodsy earthy humus the smell of centuries upon centuries. Sounds like you have happy trees. Old growth forest still exist in various parts of the country here and a rush to see and walk through. There is still ‘tree hugging’ protests on occasion when old growth forests are under threat of development. What is encouraging of late, due impart to global decrease in demand and more importantly, a desire to protect and persevere natural occurring, sensitive Eco-systems. Where large tracts of forested areas are virtually closed off, roads removed, limited to or no human interference; left to live wild. One my favourite posts of yours. I think I heard a flute in the background. You played your words beautifully. I applaud you. How do we link our intentions to the long term survival of our environment and ourselves? That is the only way we could bring our energy into a direction that matters. Hi Shakti, and thank you for this comment. Action comes when greed is outed: I can only see us all pulling together once the big corporations are shamed into ceasing their exploitation. I really enjoy your way with words, Kate and I share your love for trees. I take my camera and say: I am going out to take pictures of people… But what do I come back with? Pictures of trees, They fascinate me, they are calming. I couldn’t imagine to live without trees. Hi Dede :-)You put it so well. Trees are so calming: they deserve the limelight. Hi Debra, thinking of you all the way through this post, of course: the solemn expression on these women’s faces: this is life and death to them. I have such admiration for the way they handled everything. As you know, I do not live anywhere near a forest but in my youth I lived near Golden Gate park in San Francisco and for the past 30 years walking distance from Central Park. I appreciate trees very much, too, and I also have a big green leafy monster, the biggest and most robust on my block, that my dad hated with a passion for its long roots were forever wreaking havoc with our plumbing that cost my father a king’s ransom to have repaired. My dad spent hours on the phone begging the city to uproot it. Then the tree got its opportunity to play hero. Back around 1965, I think it was a Friday night, my family and I were all gathered in the living room of our house situated on a busy six lane thoroughfare divided by streetcar tracks. We were watching an utterly asinine sitcom called “Gomer Pyle U.S.M.C.” By the tender age of six my crap-o-meter was quickly developing, but I was a little kid and so I pretty much did what my family did. My father had worked a long day so he was dozing in his chair. My mom was reading the newspaper. My grandmother was watching the idiocy on the screen with the intensity of an Oxford scholar studying the classics. My siblings were rolling their eyes. Suddenly there was a deafening crash outside our house, a roar unlike anything I have yet to hear again in my life and I hope I never do. A motorist lost control of his car, crossed three lanes of traffic before crashing head on into the tree outside our house. Were it not for that big sturdy tree that station wagon would have crashed through our window and very likely killed us all. The tree was left with a deep gash in its trunk and although its roots continued to wreak havoc with our pipes, my dad made a truce with it and never called in another complaint. As for our big sturdy tree, it followed the lead of my mom and grandmother and got sick and died. The city chopped it down and replace it with a wisp that my father, now living in that big house alone and elderly, utterly loathes. Amazing story, Lame. Thank you, and apologies for taking so long to get back and reply. Trees in the city – what would we do without them: while yours saved lives and lost its own, so many fill cities with grace. I love the way Paris uses its trees in long avenues. And where would we be without the plastic bags that get lodged in them? Very good question about tree bagging, Kate. Last week, a colleague was looking at a Manhattan street via Google Maps and wouldn’t you know it, there was a tree with a bag in it! What a beautiful picture you paint if the forest near your home, Kate. “This is life, not that other stuff.” Indeed! I remember reading an article sometime about the wisdom of the previous King of Bhutan in understanding the ills of deforestation and moving to preserving 60% of the forests of his country in spite of economic pressures to do otherwise. That is a rare wisdom, BB. Go, King of Bhutan! You described beautifully the forest and my own feelings when I’m there. Just inhaling that air is reason enough to be there. It is. Heady stuff, that air.